Becker is engaged in ongoing research in growing and processing fibre flax and industrial hemp for papermaking. Through his company FlaxHemp PaperWorks & Press. Becker makes paper, sells flax and hemp fibre and tow, artwork, and stainless steel Hollander paper beaters suitable for cottage industry. Helmut's work has been shown internationally for the last three decades. 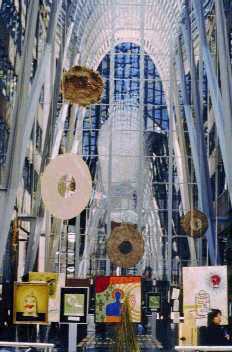 Recently his work formed part of OHA the sponsored Renewal exhibition (BCE Place in Toronto, April. 2000; see http://www.hemphasis.com/oha/renewal.htm); his work was also featured at the McIntosh Art Gallery, London, January, 2000 (solo). With this issue, The Hemp Report is very pleased to be able to present images of some of his fascinating images, supplemented by commentary by Helmut. Sciences, Western workshop: "Nouveau Pi Disc" green dehydrated hemp handmade paper, green ribbon stripped fibre, 137.2 cm (55 inches) in diameter. "My involvement in handmaking paper and linen/fibre flax research was awakened through visits in 1967 with two pioneers, hand papermaker Douglass Howell and multimedia artist Michael Ponce de Leon, both in New York. Howell designed and built his own stainless steel and phosphor bronze Hollander paper beaters, presses and tools for hand papermaking. For a time, over a half-century of research in handmaking paper, he was the only artist/craftsman active in this field in all North America. Ponce de Leon collaborated with Howell in experimentation on three-dimensional handmade sculptural prints and paper casts. He also pioneered with the Brand brothers in Manhattan to build the first machined and welded printing presses for artists anywhere. Earlier presses were made of cast iron. Through the inspiration of Douglass Howell, who experimented with fibre flax and linen, I have steadfastly conducted further research into fibre flax and linen for hand papermaking. Recycled rags of linen and hemp (used cloth, canvas, rope, etc.) 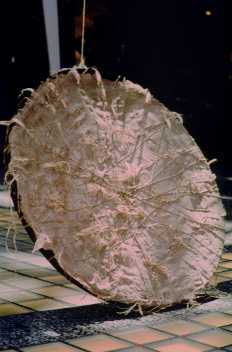 were key raw materials in Occidental hand papermaking through most of the last millennium. 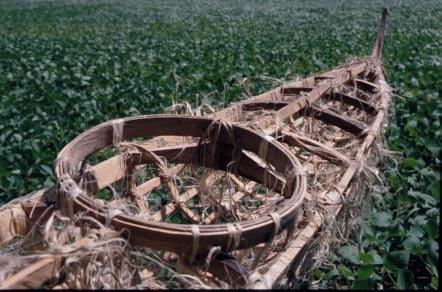 Earlier in the Orient, and to this day, a much greater diversity of plants were employed, e.g., at high altitudes the plants Daphne and bamboo; at medium altitudes, paper mulberry and, for the famous Chinese hsüan chih paper, blue sandal wood (Pteroceltis tartarinowii); and at low altitudes, rice straw and hemp. 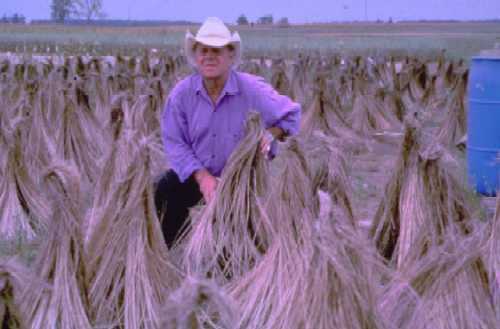 Most of these plants, excepting hemp, were not available in the Western world." 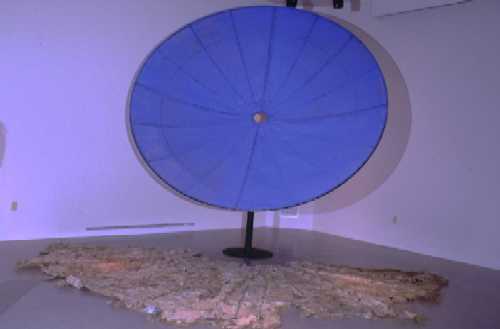 The Blue Wave Cosmic Communicator 2000 steel, iron, aluminum, field retted hemp handmade paper (fibre from Hempline) with ultramarine pigment 3.35 m x 3.05 m diam. 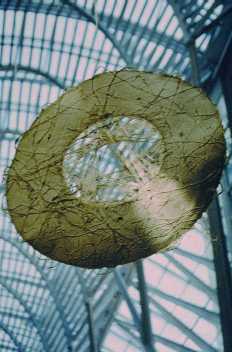 & TP Sun Dial 1990 fibre flax handmade paper, flax fibre, denim, bark, leaves, 4.57 x 1.83 m . Part of the Millennium McIntosh Art Gallery, show. "Through the Moorish invasions, the technology of hand papermaking entered Europe around 1000 AD through Spain, around a millennium after its invention by the Chinese in 105 AD. The qualities of many extant early handmade papers are exceptional for strength, permanence and simple tactile beauty. More research is needed on the exact nature of the early handmade papers of the Middle East in the period 750 to 1000 AD, as well as on early European handmade papers. Several significant studies have recently been made by Aliza Thomas of the Netherlands on early Middle Eastern handmade papers and by Timothy Barrett on, 'Early European Papers, Contemporary Conservation Papers'. To unlock the secrets of the past is not always easy. Another notable scholar is Victoria Rabal Marola in Capellades in Spain. Her findings on the design and function of medieval stampers, such as those in the Capellades Paper Museum are particularly valuable. I have conferred with all three researchers regarding subtleties involved in determining how the high quality and permanence of earlier handmade papers was achieved. All three have stimulated ideas for further research. I have made studies by scanning electron microscopy (SEM) of suitable plant fibres for handmaking paper, most importantly, of flax and hemp. A substantial part of my research and creative artwork in the past twenty-five years has involved growing experimental plots of different varieties of fibre and seed flax at the field station of the Department of Plant Sciences, University of Western Ontario. The flax plants were hand-pulled. The plants, stripped of seed clusters, were then retted in several ways: on the field by dew, on the field under snow, in a stream, in a clay-bottom pond, and in a tank. These different techniques yield a palette of earth colours, which I have used to advantage in my creation of artworks from handmade paper." Uniko B Drum 1999 running water retted hemp handmade paper, ribbon stripped fibres, wood, hemp cord 111.8 cm (44 inches) . X 3.2 cm. "I am fascinated not only by the potential of fibre flax and hemp for application in handmade paper and paper artworks, but also by the history and technology of these fibres from earliest times. I am investigating hand beating of plant fibres and the use of stampers in both East and West in earlier times and wherever still practised today, as in China and Japan. I am continuing work on natural retting in which microorganisms in the presence of water remove most non-cellulosic matter from plant material, without added chemicals. If chemicals were needed then, as Yasuichi Kubota and the late Ashiro Abbe have done in Japan or as Chinese hand papermakers in Anhui do, I would use the least amount of soda ash to do the job. When I visited Kubota, in Shimane Prefecture in Japan, on a Canada Council travel grant in 1983, he helped me handmake some green 'sekishu hanshi kozo' paper. Inner bark of kozo saplings harvested from neighbouring mountainsides was subjected to gentle physical and chemical processing, retaining the mildly poisonous green pigment which repels attack by bookworms. Today, following Kubota's rule of thumb, I prefer to process fibres using the weakest alkaline solution that will do the job of removing non-cellulosic matter. Alternately, if microscopic organisms in the retting process have already effectively accomplished the extraction, no further chemical or thermal treatment is necessary. The greater the chemical and physical abuse that plant fibres are subjected to, the more impermanent the handmade paper will be." Industrial Hemp Paper Artworks in "RENEWAL" Helmut Becker "Pi" Discs, Circles and Drums 111.8 cm diam (44 inches). X 3.2 cm. In China, the best fibre for the highest quality of handmade hsüan chih paper is sun bleached on rocky southern slopes for 6-12 months. In my own investigations, I have successfully sun-bleached fibre flax and hemp over snow in the winter. An exciting aspect of my work is the use of ''green'' (immature) fibre flax which yields finer fibres, paler and in less need of bleaching, and naturally lower in non-cellulosics. Having grown up in sparsely treed regions of the Canadian prairies, trees retain a special fascination for me. Tree materials are incorporated in many of my handmade paper art works. Wood, saplings, inner bark and leaves, worked in various ways, take on a new life. Through sculpting or fire, primordial and timeless forms and spaces are evoked." "Bundles of fibre flax have been water retted in blue drums. In either case, dew retting, or water retting, microorganisms which are already present on the plants from the soil, will activate, either in the presence of water and air. Or in the presence of water alone. Most of the non-cellulose material will have been eaten away, leaving the long strong flax fibres and some shives (straw), The wet bundles are then shaped into hollow cones and allowed to wash clean in a rainfall or two and also to sun bleach. A little later the cone shaped chapels can be turned inside out for a more even bleaching and drying. " ... it is very interesting to run a test of industrial hemp pulled by the roots, which I invariably do with Fibre Flax, which I also did last year with my experiments with industrial hemp. (Most everyone else invariably cuts the industrial hemp plants by machine). 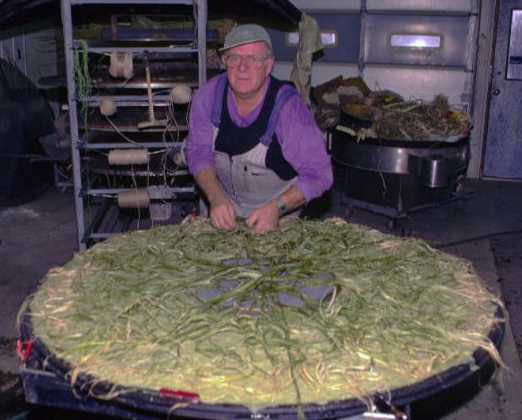 To hand pull hemp plants is back breaking hard work, and so is the hand processing step by step. To individually hand pull the green retted plants, sort out the sizes and semi strip the emerging flower/seed and leaf clusters took around 2 to 3 hours to eventually yield a kilo or so of fibre. There is the preparation of the running water tank, monitoring it and removal of the retted plants, semi-draining the soaked bundles of retted plants and then setting the semi-drained, semidried bundles in cone shaped "chapels" or lean flat layers at an angle against a support to completely air dry and be rinsed clean with a rain or shower. It is time consuming work, no two ways about it. For example, I kept track of the amount of time required to ribbon strip the fibre from the water retted hemp plants and to complete the ribbon stripping: it took between 2 1/2 to 3 hours for each of the 800 grams sets of 100 % free of hurd clean ribbon stripped hemp fibre... beautiful ultra strong fibre ... intend to hand spin some into yarn, thread or twine and possibly twist into rope segments. The above labour intensive means will provide superior both fibre flax and industrial hemp fibre from which to create highest quality handmade paper for the fine arts and for archival work. ..."
"My 15 foot "Arctic Kayak" is a slight "takeoff" reconstruction of the design of a Mackenzie Delta kayak. The following site I found invaluable: http://www.arctickayaks.com"
From Arctic Kayaks, David W. Zimmerly: "There are four known Mackenzie Delta kayaks, three of them in the Canadian Museum of Civilization collection. The construction is elegant. 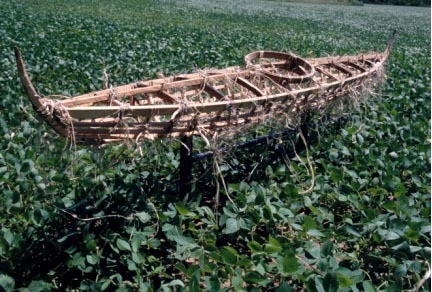 The Mackenzie Delta type is an inland kayak used to hunt beluga whales in bays and estuaries. All inland kayak types require a balancing act to paddle." 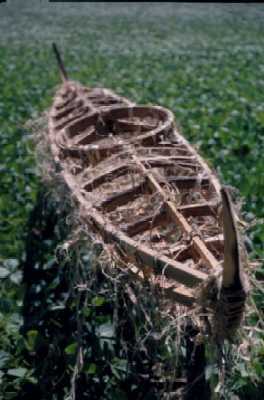 "The framework structure my kayak consisted of found weathered wood carved horn shaped stem and stern, steamed and bent found wood deck beams, ribs, circular cockpit and gracefully curving light 14 foot cedar gunwales, side stringers, keelson and deck stringers. All the wooden parts are intricately hand tied with hemp cord and hand ribbon stripped hemp fibres from hand pulled green hemp plants, running water retted hemp plants and earth retted hemp plants. This gave 3 distinctly different earth colours." 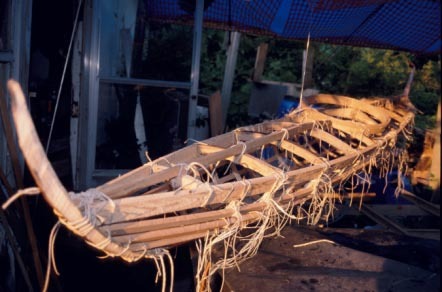 "My original intent was to cover the tied together wood structure of the sleek kayak with earth coloured hemp handmade paper sectors stretched taut to simulate sewn together seal skins. Perhaps paper pulp spray natural ochre colour hemp paper "seal skin" like layers over the intricate framework but the reconstruction looked so interesting on it's own at this juncture, that I simply decided to leave it intact at this stage." "An old man named Saumi. Left-Handed, had died and his elegant kayak rested on its stone rack near his grave by the Inukjuak River. The rack was to protect the skin from the teeth of dogs, who in the north will eat anything. His widow had seen me admiring it and when she noticed that I too, was left-handed, she decided to give me his kayak." "The seal skins on Saumi's kayak were worn and opening along the seams. The many bent, wooden ribs needed to be retied with sealskin lashings and the whole kayak frame needed recovering. The old woman offered to organize the new sewing, and I contributed a skin or two, which was the custom." "Old fashioned, perhaps shamanistic rules took over when it came to sewing the kayak. All men were warned by the women to keep away during the whole skin-covering process which, because of tradition or for practical reasons, had to be completed between dawn and dark, I was very eager to see the Kayak repaired, so, using binoculars, I watched from a distant place among the rock. What would I do with a soggy-looking Kayak covering like that? I was totally wrong. In the morning breezes, the scrapped kayak skins soon dried and tightened to drumhead smoothness and the early slanting sunlight made the kayak partly transparent, showing its inner ribs in a golden glow." Becker: "Something quite similar and equally surprising would happen if I had covered my kayak reconstruction with strong earth coloured hemp handmade paper. In the wet state it would at first appear slack and limp but upon drying would become taut as a drum and semi-transparent in sunlight and very strong. This will be a challenge for a not too distant future kayak project".~ Helmut Becker, Summer 2001.